Sourced from the terroirs around Domaine de Durban, the grapes for this red Rhône are sourced from parcels next to the village of Beaumes-de-Venise. These vineyards were traditionally used for the family’s personal consumption, and many of the unused grapes were sold off in bulk. As none of this was for commercial bottling, the Leydier family made no effort to have these parcels included in the A.O.C. Côtes du Rhône when the boundaries were first established in 1937. 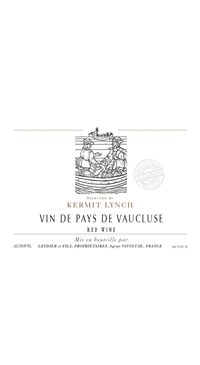 Upon hearing that the family had been selling these grapes to the local cave cooperative in Vacqueyras, Kermit presented the Leydiers the idea of creating a value-driven second label. The plan soon evolved into a collaboration between the family and Kermit. Together, they bottle both a Vin de Pays de Vaucluse Rouge and Blanc. A blend of 55% Grenache, 20% Syrah, 15% Merlot, 10% Marselan. Harvested by hand and 100% de-stemmed. Grapes ferment by carbonic maceration in temperature-controlled, stainless steel cuves. Wine goes through malolactic fermentation in cement cuves and ages for 8 months in cuves before being bottled unfiltered.